I love visiting places with ancient archeology to explore, a wonderful gateway to learning more about that place’s history and culture. So far, I’ve enjoyed the Acropolis in Athens; Pompei, the Colissuem and many others in Italy; Petra and Jerash in Jordan; Baalbek in Lebanon; Machu Picchu, Sacsahuaman and several others in Peru; Ayutthaya in Thailand; Stonehenge in the UK plus a slew of Roman amphitheatres across various countries in Europe. There are so many more on my wishlist, including sites in Cambodia, Chile, China, Egypt, Guatemala, India, Indonesia, Mexico, Syria and several others. Do you also love to visit archaeological sites? Which ones have been your favourites? These ruins are the beautiful Temples of Baalbek in Lebanon, which we visited in 2011 on a wonderful gastronomical tour of the country. Baalbek is located in the Beqaa Valley, about 50 miles northeast of Beirut, and about 12 miles from the Syrian border. Although excavations and historical records show that the area has been occupied since 200 years BC, the temples are believed to date from the Roman era, built on the foundations of an earlier site. 18 Comments to "Travel Quote Tuesday | What Were They Thinking?" I love it too! It’s amazing to stand among ruins and be able to imagine what life would have been like when they were at their peak, especially when you manage to have a place all to yourself! I love exploring ruins and imagining what life was like. My favourites this year have been Herculaneum and Pompeii. I’ve never been to Lebanon, would love to visit there one day. Archaeology is something that forms an integral part of our travel plans. Whether it is the ruins of Rome or the vast remains of the Vijaynagar empire in Hampi, it never fails to awe us with stories in stone that have survived the test of time. Indeed these sites are windows that look back in time and enrich the present generation with so much knowledge. I return to Sicily every year, so I have to say the Greek theatre and the ruins there. You’ve been to some great places, I’d like to see them myself someday! Archaelogical sites are a must see for me. I haven’t seen too many major historical excavation sites like they have in Italy and Greece, but I can definitely understand the appeal. I’ve heard awesome things about the places on your list, and I have one more to add if you ever make it to Iran – Persepolis. It’s on the World Heritage list and massive! I’m always amazed by how some of these sites are still standing. How did theycome up with some of the math and technology to place them where they are? We can learn so much from them. I truly agree with this quote as I too love to visit ancient sites. We really learn a lot from those sites about their failures and success. Learning from past experiences is always great to lead a successful and beautiful future. I haven’t had a chance to visit too many archeological ruins on my travels. I did really enjoy visiting the Roman Baths in Bath and learning about how they designed the baths, which was really fascinating. Not sure if you can call those ruins, since they’re still standing pretty well (though they used lead pipes for the water so you can’t exactly take a bath at the origianl Roman baths). I totally agree with this quote! I love the ancient architecture so I try to visit as many archeological ruins as I can. By looking at them I can imagine about the past and learn more about the history. Those ruins are incredible. Architecture does an amazing job of telling the stories of past and current civilizations. I love seeing what the styles of the day were. 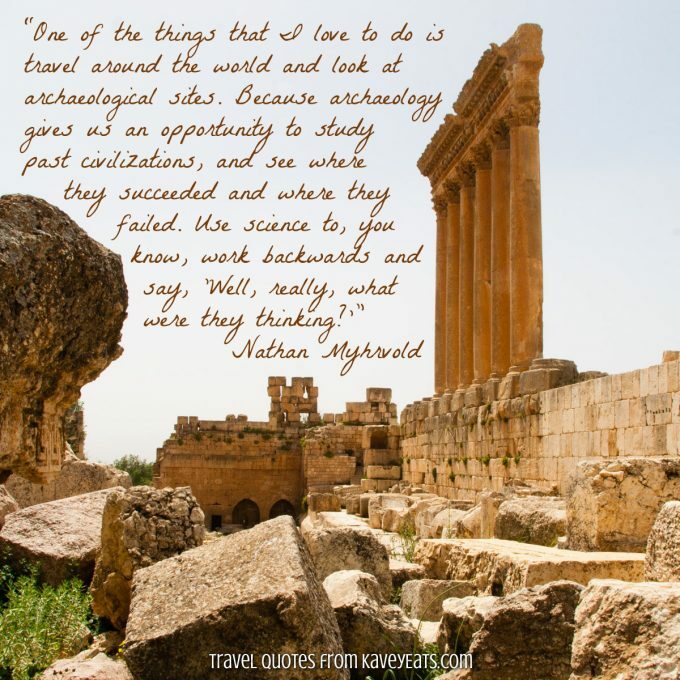 This quote is so true and is part of the reason why I seek out UNESCO sites that have an archaeological past. It is like walking back in time and living the experiences of the ancient civilizations. That’s a really beautiful quote. I really love going to archaelogical sites and that quote is so perfect. I LOVE visiting archaeological sites. I am really into ancient ruins, because it fascinates me how they were so detailed and massive despite modern tools. It’s always so fascinating visiting archaeological ruins, what they manage to find out is incredible. I saw some fascinating excavations by the pyramids of Meroe in Sudan but my favourite was Petra!